PARTNERS IN GOVERNMENT, the Irish Loyalist Democratic Unionist Party (DUP) are by far the most right-wing, backward in social attitudes and bigoted in Parliament. The Agreement signed on 26 June gives an extra £1 billion in funding to Northern Ireland, and pledges not to change the triple-lock on pensions and an axes the proposed means-testing for the winter fuel allowance along with other empire-defending measures in return for their 10 votes. The cynical corruption in the ‘Cash for Ash’ scandal is only the latest of a series of appalling corruption scandals to engulf the DUP. The main concern of the UK government is to prevent exposure of all these scandals and the emergence of the political conclusion that this is an illegitimate state. The DUP are homophobic, anti-abortion misogynists and Christian religious fundamentalists with strong historic and current links with loyalist death squads. A former loyalist paramilitary commander turned supergrass has pleaded guilty to 200 terrorist offences, including five murders. Gary Haggarty, the ex-chief of the Ulster Volunteer Force’s notorious north Belfast unit, admitted the litany of crimes as part of his deal with the State to give evidence against fellow terrorists. As well as the five murders, the 45-year-old, who is currently in protective custody, admitted five attempted murders, including against police officers; 23 counts of conspiracy to murder; directing terrorism; and membership of a proscribed organisation, when he appeared before a judge at Belfast Crown Court. Haggarty, who worked as a police informant during the Troubles, was interviewed more than 1,000 times by detectives in one of the biggest and most complex cases ever undertaken in Northern Ireland. We shall see from this appalling account that state collusion with the UDA, UVF and other Loyalist death squads was routine and the DUP was no more that their political representatives. And the 1986 Ulster Resistance paramilitary alliance of all these murderous mobs is where they all met. Having mercilessly attacked Corbyn and McDonnell for allegedly supporting the IRA ‘terrorists’ the hypocrisy of allying with the party which is no more than the political arm of the Loyalist death squads of the UDA and UVF is obvious. The DUP party have shared platforms loyalist paramilitaries. In 1996, former MP Rev William McCrea stood at a Portadown rally alongside LVF leader Billy Wright. This ruthless paramilitary group, which split from the UVF in 1996, was responsible for scores of murders. In the mid-1980s the DUP also had close links with Ulster Resistance, set up in response to the Anglo-Irish Agreement. The group was launched in 1986 at a rally in the Ulster Hall in Belfast addressed by then DUP leader Ian Paisley. Peter Robinson, who at the time was his party’s deputy leader, was later photographed at another Ulster Resistance rally wearing its red paramilitary beret. The group collaborated with the Ulster Volunteer Force (UVF), Red Hand Commando (RHC) and the Ulster Defence Association (UDA) to procure arms. In June 1987, the UVF stole more than £300,000 from the Northern Bank in Portadown. The money was used to buy 206 Vz. 58 assault rifles, 94 Browning 9 mm pistols, 4 RPG-7 rocket launchers and 62 warheads, 450 RGD-5 grenades and 30,000 rounds of ammunition which arrived at Belfast docks from Lebanon in December 1987. The weapons were then transported to a farm between Armagh and Portadown, to await collection by the three groups. In 2014 the DUP and other unionist parties were also criticised for joining the UVF-linked PUP in signing up to a ‘graduated response’ following the banning of an Orange Order parade in Ardoyne, north Belfast. The ‘graduated response’ later failed to materialise after the PUP, TUV and Ukip withdrew their support for the pan-unionist group amid allegations of “betrayal” over parading. In June 2017 Arlene Foster was criticised over meeting UDA leader Jackie McDonald just days after the 28 May murder of rival Colin Horner in a supermarket car park in Bangor in a UDA breakaway feud. The Glenanne Gang was a secret informal alliance of Northern Irish loyalist extremists who carried out shooting and bombing attacks against Catholics/Irish nationalists in the 1970s, during the Troubles. Most of its attacks took place in the area of Armagh and Tyrone referred to as the “murder triangle”. It also launched some attacks elsewhere in Northern Ireland and in the Republic of Ireland. The gang included British soldiers from the Ulster Defence Regiment (UDR), police officers from the Royal Ulster Constabulary (RUC), and members of the Mid Ulster Brigade of the illegal Ulster Volunteer Force (UVF). Twenty-five British soldiers and police officers were named as having been part of the gang. Details about the group have come from many sources, including the affidavit of former member and RUC officer John Weir; statements by other former members; police, army and court documents; and ballistics evidence linking the same weapons to various attacks. Since 2003, the group’s activities have also been investigated by independent inquiries: the 2006 Cassel Report, and three reports commissioned by Irish Supreme Court Justice Henry Barron, known as the Barron Reports. A book focusing on the group’s activities, Lethal Allies: British Collusion in Ireland, was published in 2013. It drew on all the sources, as well as Historical Enquiries Team investigations. Lethal Allies claims that permutations of the group killed about 120 people – almost all of whom were “upwardly mobile” Catholic civilians with no links to Irish republican paramilitaries. The Cassel Report investigated 76 murders attributed to the group and found evidence that British soldiers and RUC officers were involved in 74 of those. RUC officer John Weir claimed his superiors knew he was working with loyalist militants but allowed it to continue. The South Lenister Street bomb on 17 May 1974. carried out by the UVF under the direction of the MI6. The author was close enough to feel the blast and viewed the horrific scene after, including a woman’s severed leg with the shoe still on. The Cassel Report also said that some senior officers knew of the crimes but did nothing to prevent, investigate or punish those responsible. It has been alleged that some key members were double agents working for British military intelligence and RUC Special Branch. Attacks attributed to the group include the Dublin and Monaghan bombings, the Miami Showband killings, and the Reavey and O’Dowd killings. 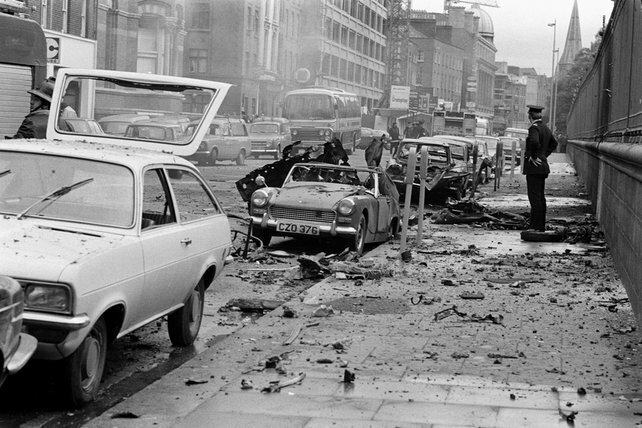 Even though UVF members were almost certainly involved in Dublin and Monaghan bombing in 17 May 1974, the British government continued with its plans to de-proscribe the organisation a week later. Most who have examined the evidence conclude that the MI6 directed the LVF in that bombing. Many of the victims were killed at their homes or in indiscriminate attacks on Catholic-owned pubs with guns and/or bombs. Some were shot after being stopped at fake British Army checkpoints, and a number of the attacks were coordinated. When it wished to “claim” its attacks, the group usually used the name “Protestant Action Force”.